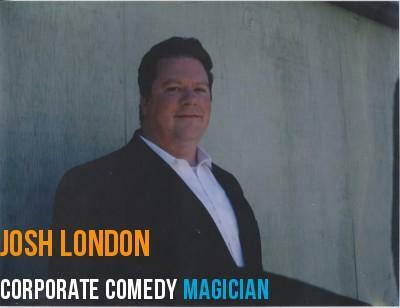 The Premier Corporate Comedy Magician - Josh London. His shows are perfect for After-Dinner Entertainment, Hospitality Suites, Conventions, Banquets, Trade Shows, and Sales Meetings. With quick-wit and sharp humor Josh will have your guests and whole company howling with laughter. Each show Josh London performs is customized to meet the needs of the group and attendees and very interactive to ensure your audience takes an active role in the comedy filled show. Whether it's Josh London's Walk Around Magic during the Cocktail Hour or Josh's Comedy Stage Show, you're guests will have the time of their life! After a long day of meetings and lectures it's hard to get the energy and focus back. Josh London's job is to make your guests feel welcome, get them mingling and talking, and give them a show they will remember for a long time. Image you have a group of hundreds of guests after a long day of meetings. What do you do to keep their energy up and get them talking and mingling? With props as simple as coins, cards, and rubber bands, Josh London has all he needs to whip your group into a talkitive and interactive mood. As your guests enjoy a drink and settle in for the evening, Josh mingles and shows groups of 5-7 people Close-Up Magic INCHES from their eyes! This is real magic REAL close! You will hear gasps as your group discovers a SIGNED card DISAPPEARS from a deck of cards and REAPPEAR in a SEALED envelope in Josh's WALLET! And that's JUST THE START! Mind Reading, Magic, Comedy, Customized! Josh London has built a SOLID REPUTATION performing his Comedy Stage Shows for companies like Steelcase, Motel 6, Merico, and THOUSANDS others. After dinner and after awards and speakers, what do you do? You sure don't want to send your group to bed, YOU WANT TO ENTERTAIN THEM!!! Josh's Comedy Stage Show is funny, interactive, and is customized to your audience. When you call to reserve Josh he will ask certain questions that will give him an insight to your company that Josh then uses to his advantage. No one is EVER embarrassed, but a little fun with the President or Chairman is always fun. Whether it's ripping the President's $100 to shreds and restoring it or READING THE MIND OF THE CHAIRMAN, your guests (and President and/or Chairman) will have the time of their life! With the Meeting, Trade Show, or Convention on the line, you need to make the BEST ENTERTAINMENT CHOICE possible. 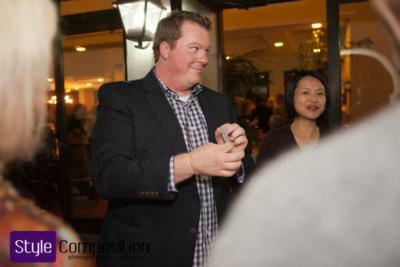 Josh London is THE PREMIER CORPORATE COMEDY MAGICIAN and he will HELP YOU make your event EXTRAORDINARY!!! Please note Corporate Comedy Magician - Josh London will also travel to Poway, Rancho Santa Fe, Escondido, Del Mar, San Marcos, Santee, Solana Beach, Cardiff By The Sea, La Jolla, Encinitas, El Cajon, Lakeside, Ramona, La Mesa, Carlsbad, Vista, Lemon Grove, Spring Valley, Oceanside, Valley Center, Alpine, Coronado, Bonsall, Lincoln Acres, National City, Bonita, San Luis Rey, Chula Vista, Pauma Valley, Jamul.